Many bodybuilders strive for strong muscle vascularity, which results in visible veins along the muscles. Even if you're just trying to bulk up for cosmetic reasons, veiny muscles can make you look bigger and stronger. Individual differences in body structure can affect how easily you increase vascularity, but with the right diet and exercise routine, you'll see more definition and boost your number of visible veins. Eat enough protein to sustain healthy muscle development. Bodybuilders need about .5 to .8 grams of protein per pound of body weight each day, according to the American College of Sports Medicine. Focus on lean, healthy sources of protein, such as fish and nuts, because high-calorie proteins can cause you to gain excess fat. Focus on hydration. Although it might seem counter-intuitive, you have to drink water in order to rid the body of excess retained water. Well-hydrated muscles look more vascularized. Your muscles are 75 percent water, and when you're dehydrated, your skin can look dry and shriveled, and your veins won't be as thick. The amount of water you need depends on your size, health and how much you sweat, but it's nearly impossible to drink too much water. Weigh yourself before and after your workout. Take frequent water breaks, and aim to consume seven to 10 ounces of fluid for every 10 to 20 minutes during intense training sessions. After your workout, drink 16 to 24 ounces of water for each pound lost in sweat. Burn off excess body fat with regular cardiovascular exercise. Focus on short, intense training sessions including exercises such as running or cycling for about 30 minutes, four to five days each week. Avoid pushing yourself to the point of dizziness or weakness. When your body runs out of carbohydrates for fuel, it can switch to burning muscle, and this will make your muscles look weaker and less vascularized. Stay active throughout the day. Circulation affects the vascularity of your muscles. If you're sedentary for too long, circulation to your arms may slow down, shrinking your veins. If you have to sit for long periods of time, take a break every 30 minutes to an hour to stretch your arms and back. Increase the intensity of your biceps exercise routine to improve arm vascularity. You can do this by adding weight or increasing the number of reps you perform. Include strengthening exercises such as bicep curls, chin-ups, rows and cable curls in your workout routine to increase the strength and size of your biceps and improve vascularity. Due to increased blood pressure in your muscles, the veins in your arms will be most visible immediately following a workout. 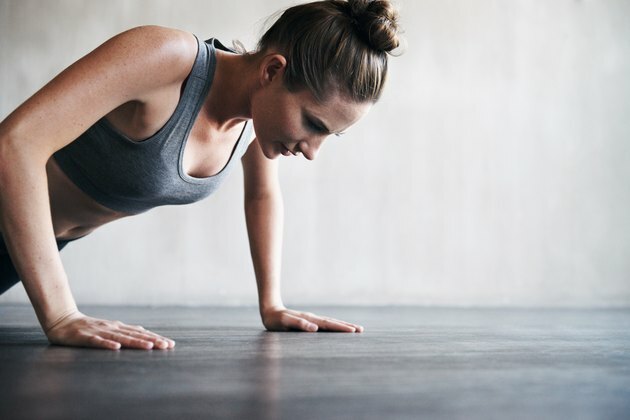 Pushing yourself to gain too much muscle too quickly can lead to pain and injuries, so start with relatively easy routines and then gradually increase intensity. If you're not an experienced lifter, talk to a doctor or trainer before beginning a new routine. How Many Calories Does a Pound of Muscle Burn Per Day?